Hardly any southern girl worth her salt wouldn't say "yes" to that question. I love grits. And contrary to what some of our northern friends think, you don't put sugar and milk 'em. Bless their hearts. They're just fine with some salt and pepper, oh maybe some cheese grits too! YUM. Part of growing up in the south (Yes, Florida IS in the south too) was to attend, and have, fish fries. At a fish fry (usually catfish), besides the fish the staple of the meal was hush puppies, grits and if somebody was to make tomato gravy to go on those grits, well, I'd call that dessert and be contented with that. Unless, of course, there was homemade peach ice cream. 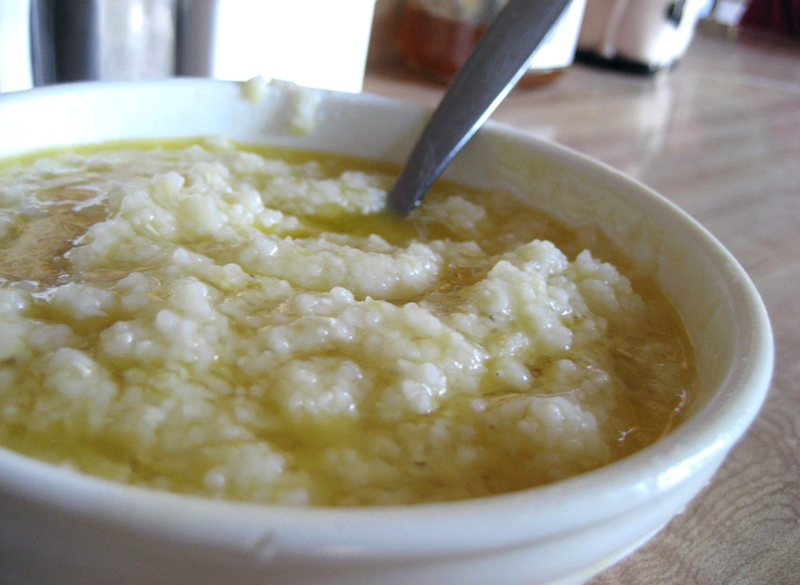 Down here, grits are usually breakfast food. (I like to mix my over-easy eggs and some crumbled bacon up in mine) but they've been known to sneak into our dinner...er, supper, menu too. Now it's getting good, because you're now going to stir in 1/2 cup swiss cheese!. Oh my! This stuff is good. But I need to clarify, this is not how we usually make cheese grits - we don't usually use swiss! Hope ya try it sometime and let me know how ya liked it. Come back Friday and I'm going to tell you how to make a fantastic Ham and Swiss Pie, using these gussied up grits as your "crust"
born and raised in the south, and yet, i will try this. the been pie, and the ham & swiss grits pie too, but i will use fontina cheese for both.